Loyalist disturbances have continued in north Belfast since an anti-Catholic Orange Order parade was rerouted from the nationalist Ardoyne area on Monday. Violence first flared on Monday night when loyalist rioters, angered at being prevented from marching through a series of nationalist estates, threw missiles, including heavy masonry. The PSNI responded with water cannon and a small number of plastic bullets. 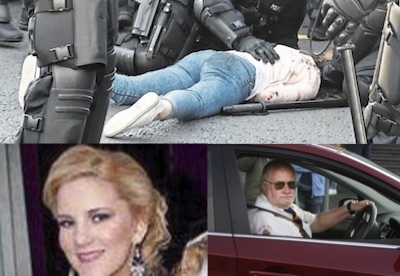 As tempers flared, a young Catholic girl was run over and seriously injured when a prominent Orangeman reversed into a group of nationalists with his car on the Crumlin Road. There were terrifying scenes as several people were knocked down. Eyewitnesses reported that the driver was hurling sectarian insults at nationalist residents through the window of the car before ramming into them. The driver, named as John Aughey (inset, right), was later arrested for attempted murder. Police joined with residents to life the vehicle off the teenager, 16-year-old Phoebe Clawson (inset, left). Local priest Gary Donegan described the harrowing scenes as he comforted the injured girl. He said he anointed her with the Last Rites. “I was holding her hand and reassuring her and she started crying and saying ‘I’m dying, I’m dying, am I going to die?’” he said. Phoebe suffered critical injuries including a shattered pelvis, a broken collarbone and a broken ankle. She is currently in a stable condition in Belfast’s Royal Victoria Hospital. A second woman was also taken to hospital after the incident which took place just yards from the Twaddell Avenue interface. A vigil for Phoebe was held near the mural of Our Lady in Ardoyne the following night. Her older sister Leigha, and aunt Patricia McAuley were among the large crowd who attended. Patricia McAuley told the crowd that Phoebe “is in extreme pain and is unable to have any surgery until next week. “While her physical injuries are severe, the physiological scars may never heal,” she said. “Our family would like to thank the people of Ardoyne, and those from across Ireland and beyond, who have sent their best wishes to Phoebe and those who have thought and prayed for her well being. “We would like to thank local residents who assisted Phoebe in the immediate aftermath of this attack, and GARC (Greater Ardoyne Residents’ Collective) for ensuring the young people were kept fully informed on the ground. I also want to thank all the young people of he area for their restraint while Phoebe waited on an ambulance. She also said the incident would not have happened if the PSNI had closed the road. “Enough is enough. The parades through this area have to stop, and the violence that accompanies them has to stop too,” she said. It was reported that the suspect in the attack has recently shared a platform with loyalist paramilitary figures, and has also acted as a spokesman for those Orange Order lodges who continue to attempt to force a march through the interface. During a protest rally last month, Aughey told Orangemen that the order “will not do the police’s job for them”. The Orange Order’s subsequent decision to withdraw its ‘marshals’ from this year’s parade at Ardoyne has been linked to the outbreak of violence. Earlier in the day, the presence of loyalists from England had been noticed before the riot began, and members of the neo-nazi English Defence League had been seen drinking in the city centre. The rapid eruption of violence had the appearance of being pre-planned for the benefit of the assembled media. Later, a previously unknown group of loyalist paramilitaries threatened members of the PSNI and the Parades Commission in a statement issued to a local news agency in the city. It said: “After today’s brutal assault upon the PUL [Protestant Unionist Loyalist] community and the random firing of baton rounds aimed to seriously injure our people we are left with no other option but to announce the PSNI and Parades Commission are legitimate targets. “We do not want to take this course of action but our people have suffered enough over the last few years and we as disengaged and disgruntled loyalists feel like the time has come for us to take action. 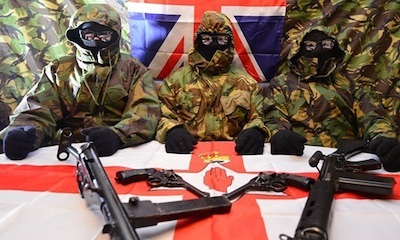 The statement was accompanied by a photograph of three people wearing masks and camouflage-style clothing sitting at a table on which appear to be two revolvers, a machine gun and a British Army assault rifle. Separately, unionists also issued threatening statements. One leading Orangeman and a DUP councillor, George Duddy, called for an “elevation” of the ‘graduated response’ previously declared by an umbrella group of unionists and loyalist against the Ardoyne decision by the Parades Commission. Separately, a number of loyalist bands ignored the determinations of the Parades Commission by playing music outside St Patrick’s Catholic church and continuing with sectarian tunes and ‘doing the bouncy’ dancing nearby. Some Orangemen whistled loyalist tunes, while one bandsman was seen spitting as he passed St Patrick’s. Unlike previous years, no nationalist protest took place after the Carrick Hill residents’ said last week it had disbanded. Its former spokesman, Frank Dempsey, said he was unhappy with the PSNI operation. There were also breaches of Parades Commission determinations at an east Belfast interface as bands played sectarian tunes as they passed the nationalist Short Strand. In another incident, two men from Morocco and Portugal were racially abused and then attacked in central Belfast by a group watching an Orange parade. The PSNI “just told us to keep moving on” and did not detain any of the group who had initiated the racial abuse, he said.